Tucker Maxon Oral School Pitfall: A Cult of Ignorance – …And the Truth Shall Set You Free. My beloved mentor Carl Schroeder has helped and taught me to promote awareness as a Deaf person to tell my stories about myself. Not only that, but he taught me to recognize the phenomenon of Audism. Stories must be ignited with a fireproofer with education inside us Deaf people. Now I would like to question “Tucker-Maxon Oral School Mission Statement” why Audism is not in the policy books. 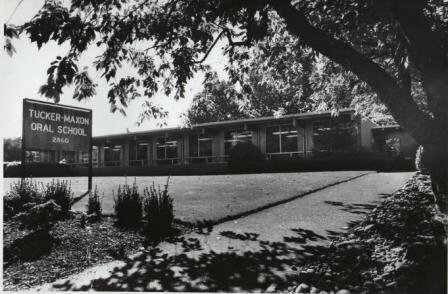 It is bully-alike against the Deaf students in oral schools that have long been part of the repertoire by which school administrators had reinforced their position of social and political superiority. Audism had been a way to assert hearingness as a sign of privilege. Tucker-Maxon’s policy is to ban sign language there. They are the worst language bigots in Portland, Oregon. Isaac Asimov, a professor at Boston University wrote a powerful book called A Cult of Ignorance in 1980, “There is a cult of ignorance in the United States, and there has always been. The strain of anti-intellectualism has been a constant thread winding its way through our political and cultural life, nurtured by the false notion that democracy means that “my ignorance is just as good as your knowledge”—is exactly going on in schools that teach Oralism for Deaf students. Dr. Wallace Bruce lied to my parents very much that my parents thought I would be successful. 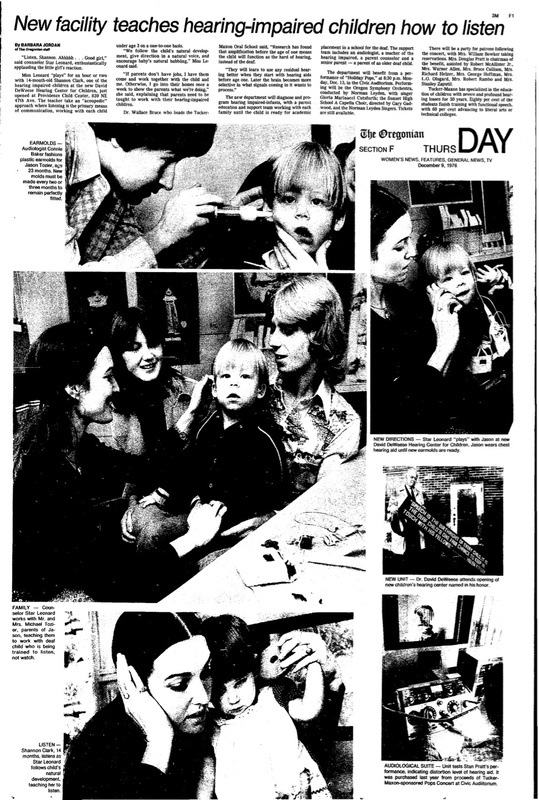 I was featured in a newspaper called Oregonian dated December 9, 1976 where they wrote a story about me with my parents how Tucker-Maxon would change people’s life. It was the biggest lie in 1976 even today 2014, too. Dr. Wallace Bruce made a hoax statement in newspaper, “Research has found that amplification before the age of one means the child will function as the hard of hearing instead of the deaf.” Today my status is Deaf. Nothing will ever change me. Click the picture below to enlarge and read the article yourself. What does it mean to be “hearing”? There is no beginning, the side of the book, to a history of “hearing” term; its roots take hold too firmly on the stories of the Deaf. 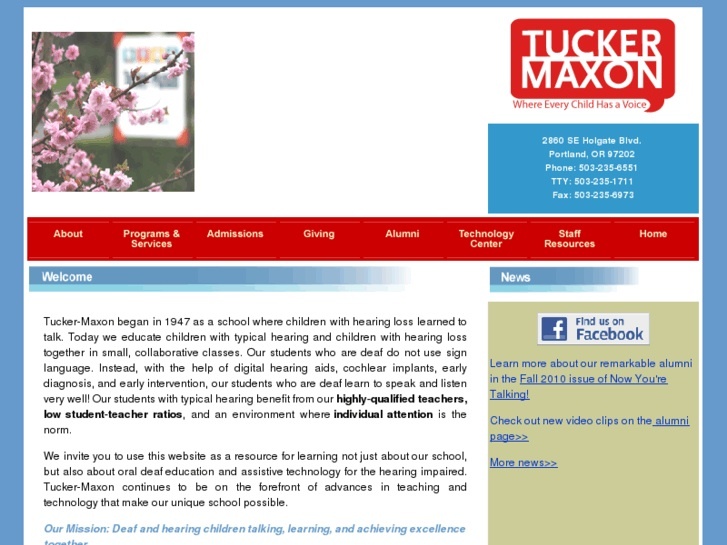 Tucker Maxon makes sure that Deaf students must be “hearing” and profit them off for their moneymaking machine. They make Deaf students “hear” through high “hearing” technologies. The “hearing” practice scarification, putting cochlear implants in Deaf babies. There will be always “sound-oriented” teachers, school administration, principals, speech therapists, and audiologists governing Oral schools for Deaf students. Allowing the elements of Audism in Oral schools like Tucker-Maxon is a social responsibility, not a private one. It is very important to know who have the key to destroy Audism and must be removed from those places. There will always be hearing people who hate our condition, that is, being Deaf, just there will always be Republicans who hate Democrats. It is well known today that there is an invisible Audism in schools and it is our responsibility to remove the “assault” weapon. Anyone who looks up to the Audists must sign a private agreement, and it is subject to be disclosed for their own selfish and their hearing privileges. This is about stripping a class of Deaf students of their own human rights. After all, victory is only as great as one’s enemy, and we are not winning the war of Audism for the protection of our most valuable resource, DEAF RIGHTS. How much damages were done to me in the past. I thought that higher learning is what rescued me from insanity. The first two years of my toddler years, I was forced how to learn Oralism and realized that it was a bruised ego. Even though I was taught several stereotypical notions about Deaf people. Will Deaf people get fair treatment by getting a pursuit of happiness that is guaranteed by Constitution? I refuse to get into “plantation politics” there and I know that the students can make all the difference if they are so democratic in thinking! They do not have teachers who are democratic. They are struck. I am a human being, not a farm animal that can go in and out of the gate. I am tired of being damaged over and over. I grew up by ignorant people and brainwashed by ignorant physicians, audiologists, educators, psychologists, and interpreters. I left the world of Oralism at age of four where my parents saw the list of abuses and immerse myself in the community of my own—Deaf community where the need is. Stories will give plenty of hopeful pictures to give people to tell their experiences. It is part of healing. Again, there are plenty of stories about plantation politics also about mainstreaming schools that prevents Audism expansion, which is socialized insurance, went out without a hitch. Let’s search your souls and ask yourself if you would have the courage to defend yourself from dealing with bruised ego. What we really need from Oral schools and mainstreamed students are stories as sidewise arguments in literature that Oralism is a huge hoax. Tucker-Maxon thinks politics and government do not affect Oralism where they promote ‘hearing hero’ month where a student would talk, listen, hear, and act like hearing person. Deaf students are colonized at best! Politics is the process of making collective decisions in a community, society, or group through the application of influence and power. United States Government can be a threat to our liberty by using American Sign Language (ASL), but we need to remove their private language bigotry first. My blog is not academic discourse. It is for a general readership. I would not want anyone to kick me around.